Almost any type of human use of land and resources causes ecological disturbance. Man has exerted his influence on the Georgia coast for centuries, and the impact of man on this system is evident in the preceding discussion. Many of man's actions on the Georgia coast have produced undesirable consequences that could have been minimized by proper planning to avoid placing stress on the especially sensitive elements of the system. Frankenberg and Richardson (in Clement 1971) discussed many of the ecological restraints on recreational use of the Georgia coast. These restraints are equally applicable to other types of development and use. This section deals with some of man's general uses of the coastal zone and its resources, their environmental impact, and the limitations imposed by nature on such uses. Although this report deals with the islands, the marshes, and the coastal waters, it should be reemphasized that the ecology of these habitats is greatly influenced by ecological changes on the mainland. Two human influences that are of special significance in planning future development are depletion of the artesian water supply and environmental pollution. Although the Coastal Plain or principal artesian aquifer is a very productive water source, heavy industrial withdrawal from it in the coastal area has caused a serious decline in artesian pressure, with resulting salt water encroachment into the aquifer at Savannah and at Brunswick (Warren 1944; Wait 1962; Counts and Donsky 1963; and others). The water-bearing stratum is confined between impervious strata. The water is under pressure causing it to rise to varying heights in wells tapping the aquifer, depending upon the artesian pressure. An imaginary surface coinciding with these heights at all points within an area is called the piezometric surface. A significant decline in the elevation of the piezometric surface in the coastal area is well documented (Warren 1944, Stewart and Croft 1960; Wait 1962; Counts and Donsky 1963; Callahan 1964; McCollum and Counts 1964; Carver 1968) and is mapped in Fig. 31. If withdrawal is very great in a locality, the elevation of the piezometric surface is severely depressed locally, creating a "depression cone." Three cones of depression are evident along the Georgia coast, centering about Savannah, Brunswick, and the St. Marys-Fernandina Beach area (Fig. 31). The foci of these depressions are the pumping sites (wells) of major industries (Savannah, Union Camp Corp.; Brunswick, Hercules Powder Co. and Brunswick Pulp and Paper Co.; St. Marys, St. Marys Kraft Corp.). Local residents report declining artesian pressure in the Riceboro area since the Interstate Paper Co. mill began operating in that area in 1968. Originally, the piezometric surface at Savannah was 40 ft above sea level, but by 1960 it had receded to 120 ft below sea level. Reduction of artesian pressure of aquifers in coastal areas creates a hazard of salt water encroachment into the aquifer. Salt water may encroach directly from the sea if pressure falls so low as to allow intrusion where the aquifer surfaces as a freshwater spring on the continental shelf, or it may encroach from ancient salt water strata below the freshwater aquifer. Both types of salt water encroachment are occurring near Savannah (McCollum and Counts 1964), and the latter type of encroachment is occurring at Brunswick (Wait 1962). Geologists point out that a decline in elevation of the piezometric surface is accompanied by an increase in recharge rates and reduced loss from wild-flowing artesian wells (Callahan 1964). They calculate that at 1962 rates of withdrawal, Savannah's water supply will not be endangered (by salt water intrusion) for about 90 years (McCollum and Counts 1964). However, the rate of pumping has approximately doubled since 1962. Despite the assurances of geologists that the decline in artesian pressure does not constitute an immediate and pressing problem, the fact remains that even present levels of withdrawal are affecting the entire aquifer (Carver 1968), and as additional areas on the coast are developed, the problem will become more acute. Unless greater utilization can be made of surface waters (and this assumes pollution control), limited groundwater supplies will place a significant restraint on future industrial development along the coast. The Georgia coast is not without pollution problems. Large industries have been attracted to the coastal region of Georgia by an abundance of groundwater and surface water, seaport facilities, climate, an available labor force, and a receptive attitude of the people. These industries, especially the pulp and paper and chemical industries, have contributed significantly to the economy of the region. Simultaneously, they have contributed most significantly to major pollution problems. Large volumes of pollutants are discharged into the air and water especially at Savannah, Brunswick, and St. Marys. Pollution to a large extent is incompatible with many uses of the coastal zone, including commercial and sport fishing, mariculture, tourism, recreation, and wildlife management. It is aesthetically objectionable and many pollutants present a hazard to human health. The coastal region is, in many ways, peculiarly sensitive to pollution. The sensitivity of estuaries to poliutants is well known and will be discussed in some detail. There is increasing evidence that terrestrial systems of the lower Coastal Plain also may be unusually susceptible to pollution. For example, disturbingly high concentrations of radio-isotopes (Cesium-137) from fallout have been detected in organisms, including game animals, from the Georgia coast (Jenkins and Fendley 1968 and unpublished). The causes of the high uptake of radionuclides in the coastal area are not known but may be related, at least in part, to dietary mineral deficiencies associated with the infertile soils of the region (Jenkins and Fendley 1968). Waste disposal commonly is regarded as one of the most important uses of moving water. The addition of materials into the aquatic environment in quantities exceeding its capacity to dispose of them results in pollution. The estuaries of Georgia receive pollutants from industries and municipalities along the coast, and from river systems carrying agricultural pesticides and sewage and industrial wastes from towns and cities along the river. Aquatic pollution is a serious problem in the estuarine system. Estuaries are not "open-ended" systems through which pollutants move via river currents and into the oceanic system. Pollutants released into the estuarine environment often remain there, retained by the same mechanisms that trap nutrients. Tidal oscillations prevent their dissipation into offshore waters and, to a large extent, they simply move back and forth within the estuary (Fig. 32). Fig. 32. 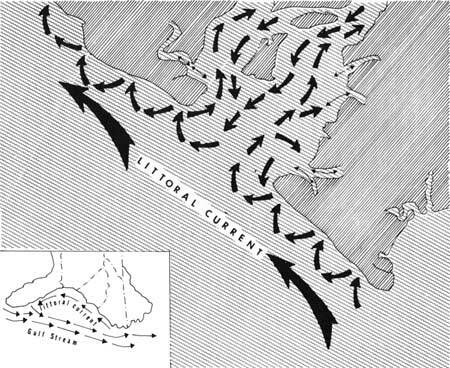 Map showing oscillatory tidal currents (small arrows) in Ossabaw Sound and inshore waters and the littoral current (large arrows). Sediments and detritus as well as pollutants move back and forth within the estuary while being carried southward by the littoral current. Inset map shows the littoral current in relation to the Gulf Stream. The littoral current may move some pollutants southward alongshore (Neiheisel and Weaver 1967) and, therefore, estuarine pollution must be considered on a regional basis rather than on the basis of political boundaries. Pollutants dumped into estuaries as far north as Pamlico Sound, N.C., may be carried southward with the littoral current and eventually into Georgia estuaries. Pollutants may be introduced into aquatic systems intentionally (waste disposal), accidentally (spillage, malfunction of treatment facilities) or in subtle ways that often go unnoticed or unidentified for many years (runoff from agricultural lands, radioactive fallout). Different kinds of pollutants create different kinds of problems. For example, sewage effluent consists largely of organic substances which are degradable by natural processes. The oxidation of these substances in waters results in increased biological oxygen demand (BOD), temperatures, fertility, and turbidity. These changes in water quality bring about major alterations in the biotic composition of the waters. Industrial wastes, which are much more variable, commonly include acids, dyes, oils, heavy metals, inert materials, wood fibers, and hot water. These substances may create many of the same problems as domestic sewage. In addition, many of them are not biodegradable and thus may persist for long periods of time. They may be stored in the tissues of organisms and thus increase in concentration at each trophic level (biomagnification). Some present problems of acute toxicity; others cause more subtle forms of physiological damage. Domestic and industrial pollution in the lower reaches of some mainland rivers may be affecting the spawning runs of anadromous fish by forming barriers, preventing fish from ascending the rivers to spawn. Most tidal creeks adjacent to areas of human habitation receive sewage effluent. Most of this effluent receives little or no treatment before its release. The extent of pollution by sewage may be seen in Figs. 35A-H (Appendix 6), which show areas closed to oyster gathering by the Georgia Department of Public Health. Pollution severely depresses the commercial harvest of this economically important shellfish even though the oysters themselves may not be harmed. Because many of the state's oyster beds are closed, few attempts have been made to determine the residue levels of chlorinated hydrocarbons, radionuclides, and heavy metals in oysters. However, oysters are known to concentrate very high levels of some of these substances, and oysters from many beds on the Georgia coast may be unfit for human consumption even if sewage pollution could be halted. Among the more significant industrial pollutants discharged into the estuaries are heavy metals (mercury, cadmium, zinc, lead, et al.). The extent of heavy metal pollution in Georgia rivers and estuaries is not known at present, but studies are being initiated to determine types, distribution, and biological effects of heavy metals. In the summer of 1970 the Savannah River below Augusta was closed to fishing because of methyl mercury pollution attributed to Olin Mathieson Co. at Augusta. Blue crabs in the Savannah estuaries, 180 miles below the pollution source, were declared unsafe for human consumption. Blue crabs in Brunswick Harbor were also declared unsafe for eating because of mercury pollution, in this case attributed to Allied Chemical Co. These industries have reduced the volume of mercury discharged, but the residue will remain in the rivers and estuaries for an unknown period of time. Some industrial pollution is very acid and is known to increase the acidity of nearby waters to toxic levels. Large volumes of industrial pollutants having a high BOD are released daily into the coastal ecosystem. As previously stated, these pollutants pose a serious threat to the productivity and stability of the estuarine community. Pesticides most commonly enter the estuaries in runoff from agricultural and forest lands (Butler 1968). Many chlorinated hydrocarbon pesticides are magnified in the food chain. Detritus-feeding, bottom-dwelling organisms concentrate these pesticides, and they are further concentrated at each higher trophic level on the food chain. Pesticides may appear very quickly in some marine organisms following their use in the environment. Oysters accumulated 8 ppm DDT 24 hours after beaches in Florida were sprayed to control stable flies (Butler 1968). In addition to their implication to human health, pesticide residues adversely affect many animal populations. Crustaceans such as shrimp are very sensitive to chlorinated hydrocarbon pesticides, and high mortalities may result from their exposure to these compounds. Mirex is a chlorinated hydrocarbon compound currently being distributed by airplane over vast areas in an attempt to eradicate imported fire ants (Solenopsis saevissima). Although estuarine areas are not to be treated, Mirex enters the estuarine community via runoff from mainland areas. Mirex is toxic to some marine organisms. It has been found to be lethal to juvenile blue crabs at the standard application rate of 1.25 lb treated bait per acre (Mahood et al. 1970). Chemical control of salt marsh mosquitoes has caused pesticide pollution of some estuaries of the Atlantic states. Formerly, the most commonly used control agent was DDT. This compound has been used as an adulticide for mosquitoes in coastal Georgia, but Malathion is now being used (H. F. Schoof pers. comm.). Paris green (copper acetoarsenite) vermiculite pellets or No. 2 fuel oil with a surfactant are used as larvicides in the marshes (H. F. Schoof, pers. comm.). None of the chlorinated hydrocarbon compounds such as DDT have been used as larvicides in the marshes. Pesticides have been detected in some economically important marine fish (e.g., tuna) at levels unsafe for human consumption. Species such as tuna seldom enter the estuaries to feed and therefore must be acquiring pesticide residues from prey species, such as menhaden, which migrate through the estuaries during their life cycle but move offshore at certain times (Butler 1968). Butler (1968) gave an example of the biological magnification of pesticides: water 1.0 ppb; plankton 70 ppb; fish 15 ppm; porpoise 800 ppm. Pesticide residues are not necessarily confined to the aquatic environment. The decline of the bald eagle, osprey, and brown pelican is now thought to be a result of reproductive failure related to pesticide residues. The accumulation and concentration of pesticide residues by nontarget organisms, the flux of these residues through the ecosystem, and their potential threat to man should be carefully studied. However, enough data now exists to convincingly demonstrate the biological hazards of dumping chlorinated hydrocarbon and other persistent pesticides into the estuarine environments. Thermal pollution is not now a significant factor in the Georgia estuaries. Thermal pollution in other areas commonly has resulted from the operation of nuclear-powered electric-generating plants. Georgia Power Co. currently is constructing such a plant about 70 miles above Altamaha Sound on the Altamaha River. This plant is not expected to appreciably alter temperatures of the river because most of the cooling water will be recycled and reused. Water demands upon the Altamaha River will be approximately 25,000 gallons per minute, of which 12,000 will be returned to the river as cooling tower effluent. The temperature of the effluent will vary from 78° to 90° F (T. E. Byerley, pers. comm.). Schelske and Odum (1961) point out that because marshes and estuaries interact so intimately they should be considered as one ecological unit. The marsh-estuary system is very sensitive to human-induced modifications such as pollution, draining, dredging, and filling. Of the many existing and potential uses of marshes and estuaries, some require such physical alterations and some require that the system be maintained in a relatively natural condition. Following is a discussion of some of these uses: their potentials, limitations, and environmental impacts. The marshes and estuaries are valuable natural environments that have many uses which are compatible so long as the physical habitat is not drastically altered. These include commercial harvest of fish, shellfish, and wildlife; research and education; and many forms of outdoor recreation. Compatible types of recreation include fishing, hunting, nature study, boating, sight-seeing, and swimming. The marsh-estuary system performs ecological functions that contribute to maintaining the stability of the biosphere. Especially important are the roles of the system in regulation of atmospheric composition and in regeneration and exportation of nutrients to marine and terrestrial food chains. Although dredging, filling, diking, and ditching are not uses of the marsh, they are forms of management employed for various reasons such as land development, mosquito control, exploitation of mineral resources, development and maintenance of navigational waterways, and highway construction. 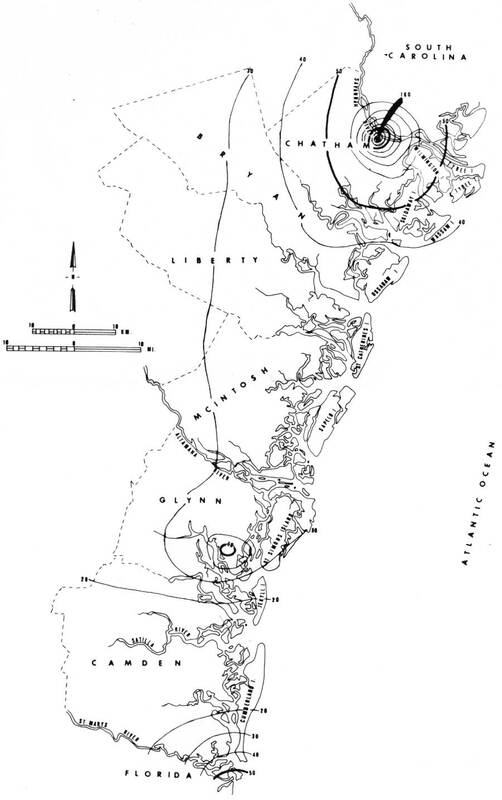 Approximately 2700 acres (0.7%) of Georgia's coastal marshes and 800 acres (0.6%) of its shoalwater habitat were destroyed, primarily by navigation projects, between 1954 and 1968 (Spinner 1969). The construction of an interstate highway (I-95) will destroy, directly or indirectly, many acres of coastal marsh, including 243 acres of prime wildlife habitat on the Altamaha State Waterfowl Management Area. Dredging associated with the maintenance of harbors and inland waterways, mineral exploitation, and highway construction, in addition to destroying a portion of the marsh, may also have long-lasting effects on the remaining marsh and on the estuaries. These effects result from alteration of patterns of circulation and sedimentation, from increased turbidity, and from BOD. Dredging increases the silt load and turbidity of the waters, thereby reducing photosynthesis of phytoplankton and decreasing primary production. Sessile and bottom-dwelling marine organisms such as oysters and clams may be buried by silt following dredging. Disturbed bottom sediments increase the oxygen demand of estuarine waters which have a naturally low oxygen content. Frankenberg and Westerfield (1968) reported that sediments from Wassaw Sound had a potential to remove the oxygen from a volume of water 535 times the same volume of sediment. Oxygen depletion of the estuarine waters could bring about anaerobic conditions which would seriously affect shellfish and finfish. Marsh areas filled with spoil from dredging operations (referred to as spoil areas) most often are permanently destroyed. Spoil dredged from inland waterways and deposited alongside the waterway destroys the marsh grass and lowers the productivity of the marsh system. Extensive spoil areas at Savannah and Brunswick have been formed from dredging channels and harbor basins. These areas often are used as industrial sites. Soils dredged and deposited on the marsh may become very acid and remain devoid of vegetation for many years. Spoil deposits often create breeding habitat for salt marsh mosquitoes and present additional control problems. Spoil areas, however, often do provide preferred nesting, feeding, and loafing areas for migratory birds. Oyster Bed Island (Tybee National Wildlife Refuge), a 100-acre marsh island in the Savannah River that has been used for spoil deposition for many years, is heavily used by gulls, terns, shore birds, and many wading birds. Colonies of least terns, royal terns, and black skimmers commonly nest on the island in the years immediately following spoil deposition (U.S. Fish and Wildlife Service undated). Improperly planned marshland causeways that obstruct tidal flow may cause the loss of extensive areas of marsh habitat. Uninhibited tidal flow is essential to the maintenance of the smooth cordgrass community. In addition to maintaining the cordgrass, tides remove sediments and transport nutrients and detritus to the estuaries. The obstruction of fluvial channels in freshwater and brackish water areas is also destructive of marsh in that it causes rapid sedimentation above the obstruction. In the case of diking for aquaculture, waterfowl management, and mosquito control, water control structures normally are used to allow regulated tidal flow into the impoundments. When normal daily tidal fluctuations are reduced or restricted, the vegetative composition within the impoundments may be altered. Stabilizing water levels in marsh areas may reduce mosquito production because the eggs require alternate periods of flooding and drying to hatch. Predaceous aquatic animals destroy many of the larvae that do hatch from eggs deposited near the edges of these impoundments (Teal and Teal 1969). Although marsh habitat is altered when areas are impounded, diversity is created, affording habitat for some forms of wildlife such as waterfowl and wading birds. Ditching marshes is a common practice for mosquito control. Ditching (1) allows a rapid runoff following heavy rain or storm tides; (2) permits free circulation of tidal water into landlocked areas; and (3) allows larva-eating predators (top minnows, killifish, and predaceous invertebrates) to enter pools of water where mosquito larvae accumulate during low water (King et al. 1960). Ditching for mosquito control usually is done in the saltgrass zone. Ditching in this zone does not destroy primary producers of estuarine food chains, but some disruption of the estuarine system (e.g., siltation, increased turbidity, and increased BOD) occurs. Some man-induced physical modifications of coastal wetlands have enhanced aesthetic qualities and contributed to recreational diversity. Without question, the development of the intracoastal waterway system has improved salt water sport fishing opportunities. The waterway provides a protected route of travel for small craft and increases the amount of area accessible for fishing. As discussed previously, spoil areas provide desirable habitat for many migratory birds. For some bird species spoil areas may contribute to a basic habitat requirement. Diked impoundments, which are excellent loafing and feeding areas for waterfowl, often provide hunting recreation that would not exist otherwise. A precise evaluation of the detrimental and beneficial effects of physical modification of marshland depends upon the specific circumstances and in some cases must await the results of current and future research. Because of the high productivity of marsh soils and the example set by the Dutch, there have been many attempts to dike and drain marshes in order to convert them into agricultural lands. The drainage of marshes, especially salt marshes, for agricultural purposes generally is not feasible. The physical and chemical properties of the soils are poorly suited to agriculture. Control of soil moisture, salinity, and acidity is very difficult, and the potential of specific sites in the marsh to form cat clays cannot be confidently predicted. Although some freshwater marshes (formerly river swamps) are potentially productive (Long 1958), management costs are high, and these lands are probably best reserved for wildlife, their present use. Marshes are profitably used as livestock range in many coastal areas. The coastal marshes are more productive rangeland than adjacent high ground, and freshwater marshes are more productive than salt marshes (Byrd et al. 1961). Native marsh grasses that are preferred forage generally are high in nutritive value, and cattle and hogs on marsh range often show impressive weight gains. Freshwater marshes provide best grazing in the spring and summer (Byrd et al. 1961). Principal forage for cattle is the young, tender growth of giant cutgrass and reedcane. Hogs forage upon a variety of species of plants and animals, but especially upon roots and tubers of plants such as arrow arum, golden club, arrowhead, and yellow cowlily. Salt marshes are best grazed in winter (October through April) because plant growth is more tender and nutritious and because mosquitoes and other insects are less troublesome then (Byrd et al. 1961). Principal forages are salt meadow cordgrass, saltgrass, and smooth cordgrass (Byrd et al. 1961). Grazing in the salt marsh is restricted to areas that are not too soft to support livestock (i.e., short Spartina high marsh, the saltgrass zone, the salt meadow cordgrass zone, and the needlerush marsh). Lack of available fresh water is a problem in many areas. The ecological effects of grazing and trampling in the marsh have not been adequately studied. Chabreck (1968) found that intensive use of marshes by livestock resulted (as on other types of range) in changes in plant composition and reduction in plant density. The tolerance of most marsh plants to intensive grazing is not known. Severe overstocking of marshes may bring about physical changes in the marsh substrate (e.g., bogginess, erosion). The culture of oysters, shrimp, crabs, and fish in diked impoundments (aquaculture or mariculture) is a potentially important use of marshes (Lunz 1968; Linton 1968). Much experimental work is currently underway, and there is considerable interest in mariculture on the Georgia coast. Marifarms, Inc. has sought permission to develop a 1200-acre shrimp farm on Barbour Island near St. Catherines Island. Mariculture currently is being practiced on a pilot basis by Thiokol Chemical Corp. on the Satilla River near Harriet's Bluff, by Marineland Farms south of Brunswick, and by S. L. Lewis on Raccoon Keys between Wassaw and Ossabaw islands. Much of this pilot work is being done in high-ground impoundments, with salt water being pumped in. Ecological objections to mariculture have been raised because of the diking involved; the blocking of tidal exchange and consequent reduction in nutrient export; the loss of marsh as nursery grounds for marine organisms; the use of rotenone for predator control in impoundments; and the potential for disease problems. More information is needed before some of these objections can be properly evaluated. Most objections would not apply to impoundments above mean high tide. If mariculture becomes economically feasible, it may become necessary to place limitations on the amount of tidal marsh that may be diked for this purpose. Although minerals are abundant in the marshes and estuaries, only phosphates have significant economic potential at this time. Prettyman and Cave (1923) investigated the petroleum and natural gas potential in Georgia and found the coastal region an unpromising area. Now there is some dredging for sand, gravel, and shell. Phosphate deposits of major economic potential lie in upper Miocene strata under Wilmington, Little Tybee, Cabbage, and Wassaw islands. Limited data indicate mineable concentrations extend at least 10 miles offshore, probably farther. The deposits become too thin to be mineable between Wilmington Island and Savannah and are too deeply buried south of Ossabaw Sound to be economically recovered (Cheatum et al. 1968; Furlow 1969). It is estimated that, using present technology, at least 800 million tons of 100% bone phosphate of lime can be recovered at a profit (Furlow 1969). The phosphorite (mineable phosphate) is covered with an overburden approximately 70 ft thick at Savannah Beach, increasing to about 150 ft under Ossabaw Island. Mining with present technology would involve stripping the overburden from the phosphorite and would produce major ecological disturbances, the overall significance of which is difficult to assess. The Kerr-McGee Corp. applied in 1968 for a mineral lease of state-owned lands in Chatham County. This action created much controversy and, at the request of the Governor, the Chancellor of the University System of Georgia appointed an Advisory Committee on Mineral Leasing to study the impact of the proposed mining. The results of this study were reported by Cheatum et al. (1968). Undesirable ecological impacts that were identified included the destruction of large areas of marsh-estuarine habitat, increased BOD resulting from the disturbance of sediments, hydrologic changes and changes in patterns of sediment deposition, and increased mosquito problems. Accidental rupture of the impermeable layer capping the aquifer (the aquiclude) and consequent intrusion of salt water into the Coastal Plain aquifer is also a possibility. Many of these effects would extend well beyond the limits of the mined area. The economic impact of mining would depend upon a number of unpredictable, indirect factors including the effects on existing and potential industries such as fisheries, mariculture recreation, and tourism. Mining as a potential use of the marshes and estuaries must be considered as a single use that is incompatible with most other uses of coastal resources. It consists of relatively short-term utilization of valuable nonrenewable resources, generally resulting in long-term reduction in productivity of valuable renewable resources. The coastal islands of Georgia and adjacent states have been used most commonly for recreation, resorts, research, and education, and for the production of agricultural crops, livestock, forest products, and wildlife. The major limitation on use has been the lack of vehicular access to the islands. Insects, tropical storms, soil conditions, and other factors have imposed less severe restrictions on use. Soils of the interior habitats of the islands generally do not impose severe limitations on use. Although generally low in fertility and commonly either excessively drained (droughty) or poorly drained (swampy), they are moderately productive if intensively managed and may be used for agriculture or livestock production. Most island soils support good tree growth, and the average site index (height of the average dominant tree at 50 years of age) for slash pine is about 80 (Byrd et al. 1961). The physical properties of the soils are rated as fair for engineering uses such as grading, road-building, pond construction, and septic tank drainage fields. The engineering properties of specific soil types are tabulated by Byrd et al. (1961). To a large extent most of the previously listed uses of the islands are compatible. Although islands in private ownership normally will be managed according to the desires of the owners, the public has an interest in the welfare of the islands as a rare and endangered ecological type. Future use of the islands no doubt will be based upon either their value for intensive residential and recreational development or their ecological and aesthetic values as relatively natural areas. Like the marshes, the islands are probably best kept as nearly natural as possible. Because they are small, they cannot support much development without losing their primitive nature. It seems illogical to eliminate rare and essentially irreplaceable resources of high value in order to expand activities that can be accommodated in many other areas. The islands offer essentially unique opportunities to observe, study, and enjoy ecological processes at work. There are few other situations where processes of geologic change are so evident, where there is such great floral and faunal diversity, and where wildlife in such abundance can be so readily observed. The values of the islands in the conservation of certain species, as natural laboratories for research on population genetics, behavior and population dynamics, and for recreational and educational nature study should be a focus for any public-use program. Swimming, fishing, hiking, picnicking, bird-watching, nature photography, and shell collecting are recreational activities compatible with the preservation of these values. Above all, the islands should remain islands. Bridges or causeways make them accessible to invasion by mainland animals which could displace unusual or unique island populations. Bridges or causeways would also open the islands to the destructive impact of automobiles and the undesirable developments that accompany them. Furthermore, isolation is an important quality contributing to the charm of the islands. Construction and development should be kept to a minimum on publicly owned islands, not only because buildings occupy space, but also because of the alterations associated with providing utilities and sewage and garbage disposal. Intensive structural development is best restricted to the mainland. On publicly owned islands, natural vegetation should be preserved insofar as possible. Representative examples of all habitat types should be maintained. Live oak forests especially should be protected. Overmature, diseased, and dead trees should be allowed to remain standing to provide nesting cavities, dens, and insect food for songbirds, woodpeckers, raccoons, squirrels, and certain other wildlife species. Judicial application of vegetation control practices such as fire may be prescribed for naturalistic landscaping and to prevent undesirably dense growth of vegetation in some types, especially pine forests and sloughs. Management procedures for some island habitat types are not well known and experimental work may be necessary. Special protection is needed for certain wildlife species such as pocket gophers and alligators. Wading bird rookeries should be protected from disturbance. Exotic species should not be introduced. Certain habitat management practices may be desirable, but very intensive artificial management should be avoided. The beach and dune area, one of the most attractive areas for recreation, includes some ecologically sensitive elements that need special consideration. Beaches and dunes interact physically and biologically and comprise a logical management unit. Beaches are capable of supporting high-density human recreational activities without deterioration. The number of people beaches can support is limited only by the physical dimensions of the beach and by the sociologcial restrictions the people impose upon themselves. The dynamic forces of the sea are constantly reworking the beach face, and after each high tide the impact of man is erased from the shoreface and foreshore. This pristine appearance is one of the primary reasons beaches are attractive recreation areas. One of the main factors limiting recreation on the beaches is industrial and municipal pollution. Pollution effluent from the city of Savannah occasionally discourages swimming in the waters off Savannah Beach. Unsightly residual material such as construction debris and beverage containers are often deposited by high tides on the beaches. This material lowers the recreational quality of the beach and may reduce its use by recreationists. In contrast to the beaches, the dunes can withstand only light recreational use. The fragile nature of dunes and the importance of dune stability to the overall ecology of the oceanfront long has been recognized by scientists but is still too often ignored by planners and engineers. Unfortunately, some of Georgia's most attractive beaches and dunes have been drastically modified by unsound development. Most of the dune complex has been destroyed by development at Savannah Beach and St. Simons and Jekyll islands (Fig. 33). Dunes were reduced in size or removed completely during the construction of buildings, roads, and parking areas. Stabilizing dune vegetation also has been removed or reduced by unrestricted recreational use. These alterations have accelerated erosion of the protective dunes and beaches and have necessitated the construction of erosion control structures. Groins have been constructed perpendicular to the beach (and the littoral current) to impede sand movement, and sea walls have been erected to protect seaside structures from encroachment of the sea (Fig. 33). Fig. 33. 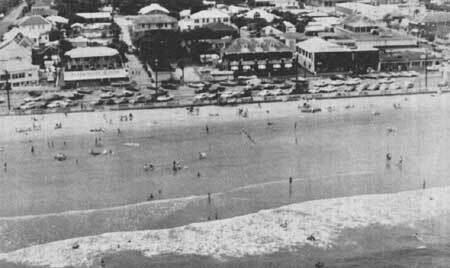 Aerial photograph of Savannah Beach, Tybee Island, May 1970, showing high-density recreational use. Note the beachside developments have resulted in total loss of the dunes. A sea wall has been constructed to retard encroachment of the sea on beachside developments. Structures designed to control beach erosion are expensive and only temporarily effective. Sea walls have a longer functional life than groins, but they are still temporary measures for retarding sea encroachment. These structures are unnatural and unsightly, and they reduce the aesthetic appeal of the area to many people. In acute situations of beach erosion, sand may be pumped from offshore areas and deposited on the beach (beach nourishment). Beach nourishment, though geologically and aesthetically desirable, is a very expensive management option. As previously noted, the loss of dune vegetation caused by overgrazing contributes to destabilization and erosion of the dune complex. Free-ranging livestock have seriously reduced or removed dune plants on Ossabaw, Little St. Simons, and Cumberland islands. Large numbers of fallow deer also have contributed to the loss of dune vegetation on Little St. Simons. Many animal species are affected by the deterioration of beach and dune habitats. Depending upon their "successional" stages, the beaches and dunes provide nesting and feeding areas for sea turtles, gulls, terns, pelicans, and many species of shorebirds. Perhaps the animal species most affected by changes in beach forms is the loggerhead sea turtle. As discussed in Chapter 3, the loggerhead requires specific beach types for nesting purposes. Beach erosion reduces the amount of preferred nesting habitat and may cause turtles to shift their nesting to other beaches if they are available. Other human influences, such as artificial illumination of the beaches and nocturnal disturbance, affect loggerhead nesting. Female loggerheads are easily discouraged from nesting by lights on the beach, lights from automobiles on nearby highways, and the illumination of beachside motels and other facilities. Artificial illumination of nesting beaches also increases the mortality of hatching turtles by disorienting them during their trip to the sea after hatching.